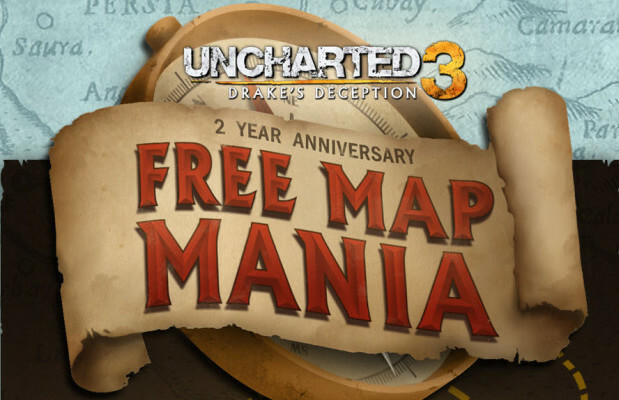 Not long ago Naughty Dog decided to make the multiplayer mode for Uncharted 3 free-to-play. This opened the floodgates for loads of new people to try out what was a surprisingly well-made multiplayer mode that could stand with the best of them. However, it wasn’t all free. The game had 3 map packs that all required a fee to access, which is a tad annoying when coming into a free-to-play game. Thankfully, that is no longer the case. In honor of the 2 year anniversary of the game, the next patch for the game makes it so every map is available for free. In addition, a new map called Dry Dock is being added for free as well. Funnily enough, the map has a bit of history behind it. According Lead Game Designer Robert Cogburn, the map was originally supposed to be used as a level in the single player game. One of the game’s designers, Junki Saita, had been toying with a few different setups for the level, with one of them being particularly suited for the game’s competitive multiplayer mode. However, the level was eventually cut from the single player game. This cause the multiplayer version of the map to fall by the wayside, since it didn’t have nearly enough care put into it as it needed upon launch. Fast forward until just recently, and Naughty Dog realized they had a perfectly good multiplayer map that just needed some touching up for release, and here it is now. The rollout of the free maps is being tied into the final patch of the game. This final patch also brings with it a boatload of balance fixes, which can be found here. In addition to all this, Naughty Dog will be doing a Reddit AMA about the game’s 2 year anniversary, with Robert Cogburn being joined by the game’s director, Justin Richmond. The date and time of the AMA can be found alongside the patch notes.